Every cook needs the right knives to get the job done! Quality pairing knives have mirror-finish stainless-steel blades that resist staining and pitting, even in the dishwasher. 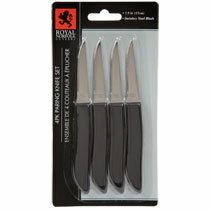 Case includes 36 , 4-ct. packs of 6" Royal Norfolk Cutlery stainless-steel paring knives. If you have any questions about this product by DT, contact us by completing and submitting the form below. If you are looking for a specif part number, please include it with your message.